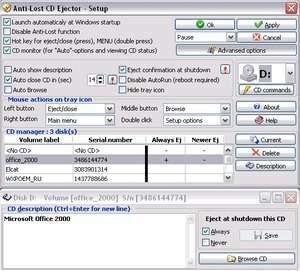 Anti-Lost CD Ejector opens your CD-drive if a disk is left inside it when you shutdown Windows. And you can manage this process with advanced Anti-Lost CD Ejector parameters. With the help of this software download you can use your CD-drive more comfortable with hot keys or mouse. For security reasons, you should also check out the Anti-lost CD Ejector Lite download at LO4D.com which includes virus and malware tests. Additional screenshots of this application download may be available, too.